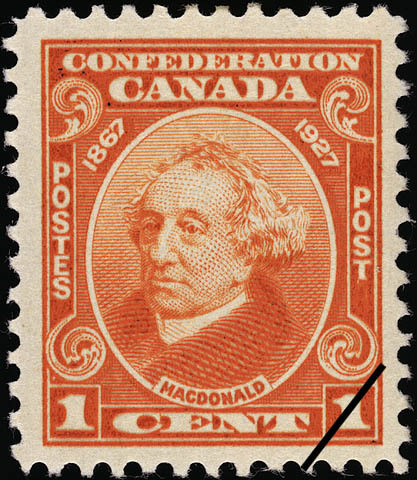 The value of a Macdonald - 1 cent 1927 stamp depends on several factors such as quality and wear, supply and demand, rarity, finish and more. Values in the section are based on the market, trends, auctions and recognized books, publications and catalogs. This section also includes information on errors and varieties and characteristics. During the summer of 1927, the celebration of the Diamond Jubilee of Confederation was fittingly carried out. A committee appointed by the government in connection with the celebrations suggested a special issue of postage stamps to commemorate the occasion. The subjects of these commemorative stamps centred around the statesmen and the events they commemorated. The stamps were bilingual with the words "Postes" and "Post." Portrait of Sir John Alexander Macdonald, G.C.B. Sir John A. Macdonald was born in Glasgow, Scotland, in 1815 and came to Canada in 1820. He entered Parliament in 1844, and in 1864 he took part in the conference on the proposal to confederate the provinces of British North America. After the conference agreed upon a basis of union, a committee went to London in 1866 to co-operate with the British government in drafting the British North America Act. Subsequently the act came into force on July 1, 1867. The day since designated as Dominion Day is annually observed as the birthday of Canada. Sir John became the first prime minister of the Dominion of Canada. He died in June, 1891, and was buried in Cataraqui Cemetery in Kingston, Ontario.